With the month of April approaching quickly and the temperature rising, the infamous Bloomsburg Block Party creeps into students minds. As students make plans with friends from all around Pennsylvania, the citizens of the town and the university dread for the day to arrive. “Even as a recent graduate, I am still excited to attend Block Party. It has always been one of my favorite days in the spring semester,” Tom Rafter said. Although it is clear why the university and townies hate Block Party, what other reason could there be besides the thousands of young adults binge drinking from 8 a.m. to the wee hours of the night? Not many students know the true history behind Block Party, but it can be found right here at Bloomsburg University’s Andruss Library. When researching Block Party, many articles described the day to be filled with games and music that was sponsored by a certain organization on campus. The event was also grouped along with Siblings Weekend, which still is an event Bloomsburg University celebrates every year. “I was surprised to hear that the notorious Block Party was just a day that students played sports and had a good time without drinking alcoholic beverages. 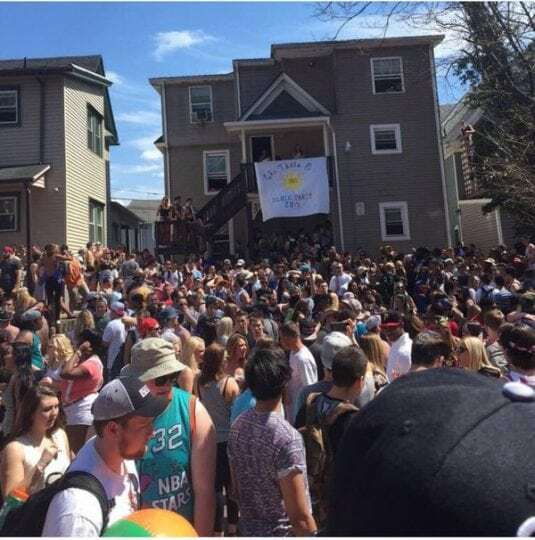 When people think about Bloomsburg Block Party now, they think of a giant party with drunk people, cops everywhere, and lots and lots of alcohol,” Richard Cain, a graduate of Bloomsburg University stated. Dating back to April 15, 1993, Theta Chi, a fraternity, organized to hold a block party to benefit the Bloomsburg Women’s Center. The Bloomsburg Women’s Center is responsible for many different things such as offering free support to victims of domestic violence and sexual assault. The block party was planned for mid-April in the parking lot outside of the Theta Chi house on Sesame Street (which is now where Honeysuckle Apartments are). Quoted from The Voice, the Bloomsburg University newspaper, “’It’s a party, but it’s also a show of support that a lot of brothers believe,’” Chris Corley, a co-chairman of the block party said. Theta Chi sold food, beverages and t-shirts in order to raise money for the Bloomsburg Women’s Center. In The Voice article, it is also mentioned that the Theta Chi brothers organized an afternoon filled with live entertainment such as a local bands and bands from other universities. Although this article is one of the firsts about the block party as we know today, the article also mentioned that only 800 people attended the event in the previous year (1992), but the Theta Chi brothers were expecting a crowd of 1,500 to 2,000 people. The most important fact that was stated in The Voice article was that the Bloomsburg Police Department was supportive of the cause and the event. The Bloomsburg Police Department being supportive of the block party is interesting and comical to read because I am sure now, there is nothing they would not do to rid the event. 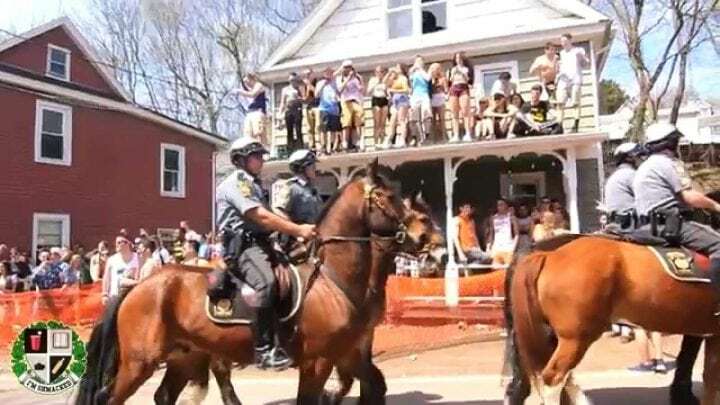 The Bloomsburg Block Party as we know, is full of booze, drunk students, and police on horses. With only 1,500 to 2,000 people expected to attend in 1993, to well over 4,000 people attending from different parts of Pennsylvania and even other states in 2017, there is no doubt saying the Bloomsburg Block Party will continue to grow. In 2012, the Bloomsburg Police Department even had to tear gas to handle the crowd on Fetterman Ave. “I heard about the tear gassing at the Block Party, and I was a senior in high school at the time. It is crazy how out of control the crowds get,” senior, Evan Brown said. In 2016 alone, there was 214 open container violations handed out, whereas in 2015, there was 135. Also, stated in an article from BUnow, more underages were given out in 2016’s block party than the combined years of 2011 through 2013. It is truly unbelievable how Block Party started off as a day for students to enjoy themselves on campus, to a controlled party to raise awareness of an organization, to finally, a day filled with binge drinking. As the date approaches, the Bloomsburg Police Department will hold an information session, as they do every year, notifying the party-goers of rules and regulations. Stay updated with campus news sites such as The Voice and BUnow to learn more and stay up-to-date with the 2017 Block Party. "The best project you'll ever work on is yourself."